We, being an ISO 9001: 2008 certified organization, assure that the premium quality of the offered range is never compromised. 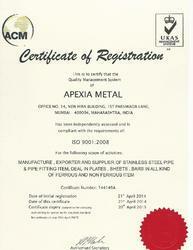 The raw materials such as steel are procured from trusted vendors to ensure high standards of quality. Different quality assurance procedures are carried out by our team of quality controllers at our state-of-the-art in house quality testing unit. These procedures start from procurement of raw materials till the final dispatch at the customers’ end. Our quality testing unit and quality controllers are upgraded and trained respectively at regular intervals of time. Being a client-centric organization, we aim to maximize the contentment level of our respectable clients in the best possible manner. For this reason, we make sure that only quality-approved range is offered to them at industry-leading prices. All our offered products are manufactured using excellent quality material so that these are in compliance with international quality standards. Our experts directly interact with clients to understand their variegated requirements and cater them accordingly. Furthermore, we ensure timely delivery of consignments at customers doorstep through our wide distribution network. Due to these reasons, we have become the most preferred choice of customers spread across the nation.